Imagine people as color pixels. Flying over the world, you would look down and see . . . what? Our planet is a composition of complexions: through migration, intermarriage, cosmetics, war, trains, planes, and automobiles, the “view from above” of the earth’s skin tones is in a continuous state of evolution. With the help of The World Fact Book, the pantone color system, data from Internet, interviews with dermatologists, research by cosmetic companies, thousands of images of people, and intuition, Reineke Otten created the World Skin Color Project, a visual analysis translated into maps of skin colors as they appear throughout the world. Based on color palettes created for all 231 countries worldwide, and using one dot to represent one percent of each country’s population, Reineke’s maps depict our changing world as a flux of skin tones. Light dots are visible through dark South Africa; faces and races mingle in Brazil; thousands of guest workers tint Dubai, while pale tourists sunbathe in the Bahamas. Each dot in this map equals 10.000 people. 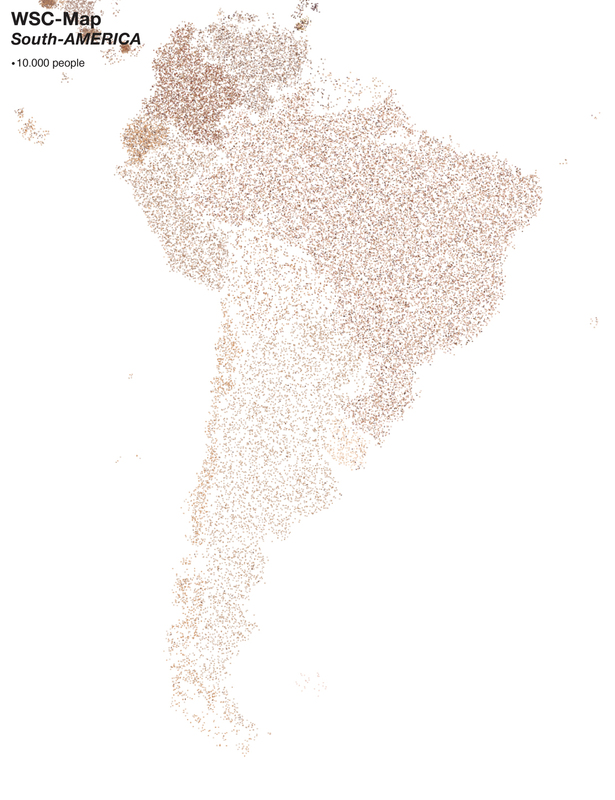 The dots represent the population in average skin color, population density and according to the ethnic division of that country. Made in Collaboration with LUST. The maps are for sale, please contact reineke@urbandailylife.com for price and size.